A toddler’s food preferences can be very unpredictable and many go through a picky eating phase. Should you have any concerns about your child’s eating habits contact your healthcare provider. What can I do about picky eating? Limit snacks and try serving meals at a consistent time each day. Picky eating can occur if a child fills up on snacks and is not hungry by mealtime. Serve new foods alongside familiar foods your child already likes. Let them explore their food through touch, smell, or trying it in small bites. Do not bribe or force your child to try a new food. Simply continue serving small portions of it along with familiar foods, and your child may eventually come around and try it. What can I do about problem feeding? If you suspect that your child has feeding difficulties beyond picky eating, keep a food journal to track their eating behavior, and bring your observations to your child’s healthcare provider. You may be referred to an occupational therapist or a speech therapist that can help your child discover new and healthy foods and improve their overall nutrition. 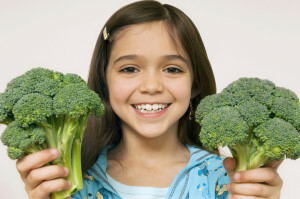 Learn great strategies to help your child try different vegetables. Use these tips to make eating at restaurants with kids easier for the whole family. Previous Previous post: What is Baby-Wearing?